Owing to the great demand for a hike with the characteristics of a pilgrimage we have created this hiking package for individual travelers starting from Sestri Levante and ending after 5 days of hiking in Portovenere/La Spezia crossing the most beautiful landscapes of the Unesco sites Cinque Terre and the Ligurian coast. It includes the accommodations in selected small hotels or boutique guesthouses with breakfast and typical dinner, a roadbook with maps and descriptions of the itinerary and the daily luggage transport from one accommodation to the next. 1st day: Arrival by train in Riva Trigoso, next to Sestri Levante. Check in at the small charming farm house “La Pergola dei Paggi” or other hotel in Sestri Levante or Riva Trigoso. At your arrival you will be given the road book with all the maps and descriptions for your upcoming hike. Enjoy your first dinner with local Ligurian specialties in the beautiful rustic-cozy ambience of the restaurant of the hotel. 2nd day: start your hiking in the morning towards your next destination – Moneglia, a charming little town by the sea. The hike will take you on not very travelled footpaths to an old lookout point passing through the wonderful Mediterranean vegetation. You will reach your destination after about 3 hours hiking time. (distance 10 km/total ascent about 400 m asl). The accommodation in Moneglia will be organized in a beautiful 3* hotel as for example Hotel Villa: It is a cozy family run hotel in the center of the village. An ancient, elegant villa, surrounded by a beautiful garden. The rooms are very comfortably furnished, the kitchen offers home cooked delicious local specialties and selected local wines. 3rd day: start your hike after a rich breakfast in the hotel. This will be one of the longer days taking you on panoramic footpaths first to Deiva Marina, then to Framura and Bonassola, where you will stay for the night. There are about 6 hours to hike. In case you are tired in between there is always the possibility to catch a train from one of the villages to reach your next overnight destination. (21 km, total ascent about 1.300 m). In Bonassola waits a simple but cozy accommodation for you, for example the Pensione Moderna in the heart of the village of Bonassola, a wonderful village on the seaside. Less than 100 meters to the seaside, in the middle of a tropical garden, Pensione Moderna offers you hospitality and all the convenience for a relaxing vacation. Terrace and garden. Free Internet Wi-Fi. Dinner. 4th day: start in the morning with a beautiful hike to the next little town Levanto (reachable through a wonderfully panoramic footpath or crossing an ancient tunnel system, the shorter but of course less panoramic option). Enjoy some lunch break in this beautiful town or have a swim on the beach before starting in the afternoon to the next part of you hike that takes you in about 3 hours right into the National park of the Cinque Terre, to a cosy hotel above the first Cinque Terre town – Monterosso. Enjoy a typical dinner here. This hotel above Monterosso is surrounded by quiet Ligurian countryside. The buffet breakfast is served during the warm season in the garden. Featuring an LCD TV with Sky channels, rooms are decorated with vivid colours and all have parquet floors. Each one overlooks the garden and has a private bathroom. Breakfast features homemade products that include croissants, pastries and cakes, along with cold cuts and cheese. The restaurant specializes in fresh meat and fish and meals can be served in the garden. Guests have free Wi-Fi access in Hotel’s public areas. A free shuttle bus from/to the centre of Monterosso is available on site. Buses to the town centre stop right in front of the property. 5th day: a tough but wonderfully scenic hike takes you from the hotel to an old sanctuary above Monterosso, later to an ancient sanctuary above Vernazza and down to the picturesque village of Vernazza, one of the famous five Cinque Terre villages. 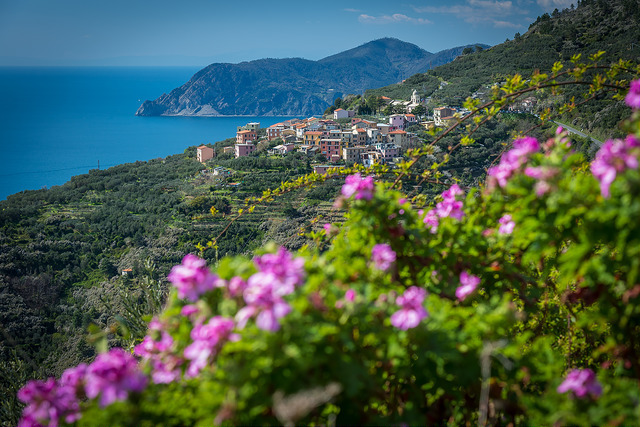 After a lunch break you continue your hike to Corniglia (another Cinque Terre village) and, crossing the vineyards with breathtaking view, to the little hamlet of Volastra where you will be accommodated in a nice family run hotel. Dinner will be offered in at local restaurant. The hotel is in the small village of Volastra, in the Cinque Terre National Park. It offers a rooftop terrace and rooms with free Wi-Fi access. All rooms at the family-run Hotel have a private bathroom and some have a balcony. Every morning, a buffet breakfast of organic products is served. The hotel is one mile from Manarola Train Station. A bus services connects Manarola to the little hamlet of Volastra. 6th day: the last strenuous hiking day with breathtaking views! Start early in the morning with your hike that takes you first on an even path to the ancient sanctuary of Montenero giving you lots of great views over the Cinque Terre villages Manarola and Riomaggiore. Then it continuous crossing vineyards and oak tree forests to the village of Campiglia. From here you can see on one side the big harbor of La Spezia, on the other side the open sea. Still two hours of scenic hike and a steep descent brings you to the end point of your pilgrimage – Portovenere! At the end of the day you will take a short ferry boat ride to La Spezia where we will have arranged for you the last night of your pilgrimage package in a guesthouse or hotel in the centre of the town, as for example Hotel Genova. Dinner is arranged in a very typical and traditional restaurant in the centre of the town. 7th day: after breakfast the tour ends. for the months of July and August there is a supplement of Euro 70,00 per person to be added to the high season price. for the months of July and August there is a supplement of Euro 60,00 to be added to the high season price. Included services: accommodations for a total of 6 nights in guesthouses or 2/3* hotels as by description or similar in dbl room with own bathroom and breakfast every day. Dinner in the guesthouse/hotel or in a typical restaurant (usually the dinner consists of 3 courses – first course, main course, dessert – drinks are not included), luggage transfer every day from one accommodation to the next, boat ride the last day Portovenere – La Spezia, entrance fee for the national park of the Cinque Terre. Maps, roadbook and description of the hikes. Local emergency assistance 24 hrs (phone number to call). Not included: lunches, tips, entrance fees, all services not mentioned under “included services”. City tax: In some of the places there is a city tax to pay. This tax is local and subject of frequent changes. It has to be paid in cash upon arrival and is not included in this package. However, its cost in our area is never more than Euro 2,00 per person and day. Availability: Please take note that this service is always on request. No allotment has been blocked yet and availability will be checked at the moment of the request. All offered hotels/guesthouses are very small and popular family run places. Thus program changes can be possible as well as alternative accommodations in case of booked out spaces.